Comet 206514-A activator pucks. One Pack of 3. Spec: 7/8" steel insert. Weight: 53.5 grams. 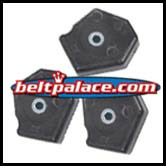 Home > Comet Clutches and Parts > Comet 211483A Puck Kit for Ribbed Cover 94C Duster. 3-Pack. > Comet 211477A Wedge Activator Pucks. Solid Plastic. Package of 3 > Comet 205858A. “PINK” Spring Kit for 94C Drive Clutch. > Comet 206514A activator pucks. One Package of 3 Pucks. Comet 206514-A activator pucks. One Pack of 3. 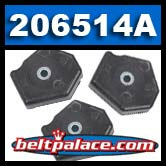 *For use with SMOOTH COVER (#205760A) Series 94C Duster units.